It's been some time since this page was last update, but 'recent' is such a relative term, I feel. This past year I have been getting back to my roots, with the large Toronto Stock Exchange painting (below), to date, my largest painting. 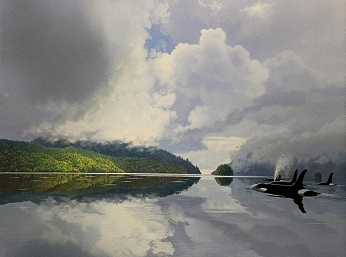 Below this, as you will see, I revisit Haida Gwaii – twenty-nine years later – with a group of my artist friends. 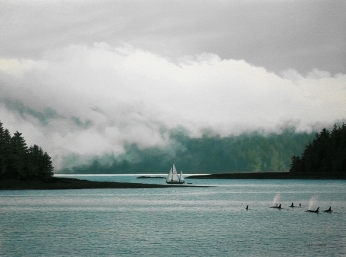 Haida Gwaii is the place my journey as an artist began, in 1988. The magic of this place remains undiminished, and two others from our group have been similarly 'moved', to leave their 'day jobs' and focus on art full time – Anja Karisik and Gary Landon. Please continue to follow us on our journey (links to the artists in our group can be found at the bottom of this page). For the moment though, I hope you'll enjoy the selection of 'recent' works below. 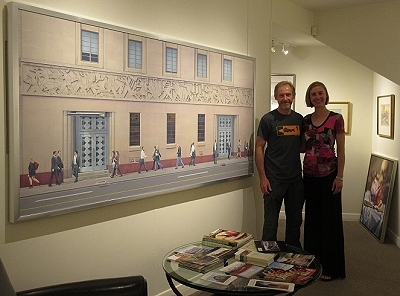 My largest painting to date, as you can see, harkens back to my days in the financial world in the late 80s. Here, Anja Karisik and I (having just returned from our Haida Gwaii expedition) with my second Stock Exchange painting, 'Exchange II', August, 2016. Occasionally, my favourite smaller works, become 'studies' for larger piece, and this was the case here. 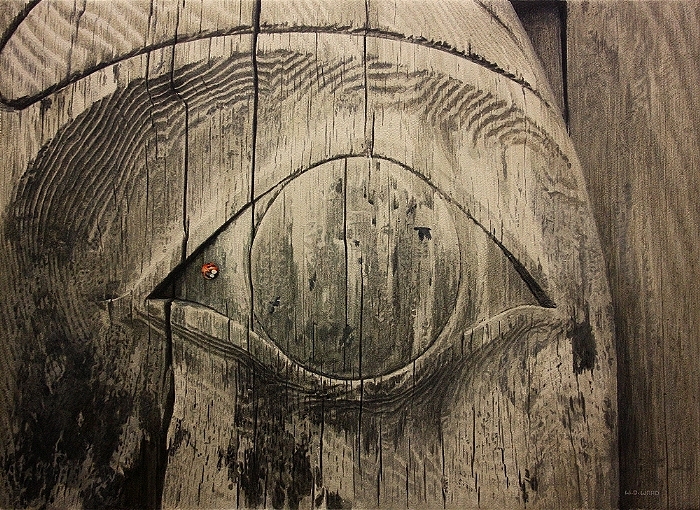 From this point on, of course, Haida Gwaii took over my life (again) and a flood of related works were soon to follow. 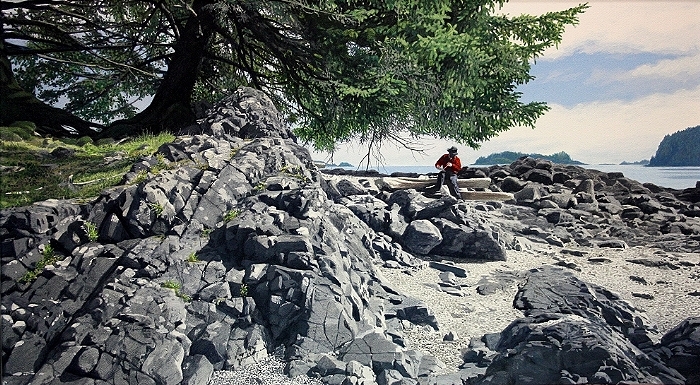 You can read about our adventures in 2016 at the links at the bottom of this page but, for now, I hope you'll enjoy the selection of Haida Gwaii works below. 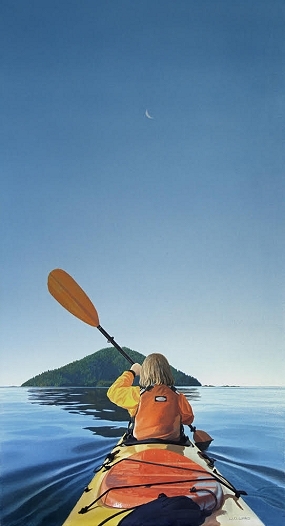 "Ninstints – Key Deer "
Late in the afternoon, the day of our arrival in Gwaii Haanas, a group of us went for a paddle in the uncharacteristically calm (mercurial) waters. 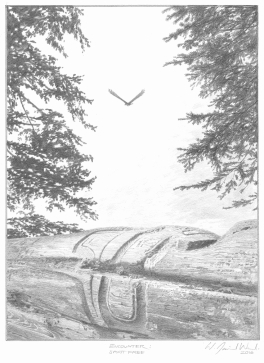 Oddly, I'm not able to identify this island on my charts; this image, therefore, has come to represent (for me) the mystery of Haida Gwaii. The above painting, created for my 'Cascadian Seduction' Exhibition at Loch Gallery, has been held back for our next ReEncounter Group show, at the Robert Batman Centre – June 15th thru September 30, 2018 – in Victoria. The project is based on our Eyes Of Society video – details soon. 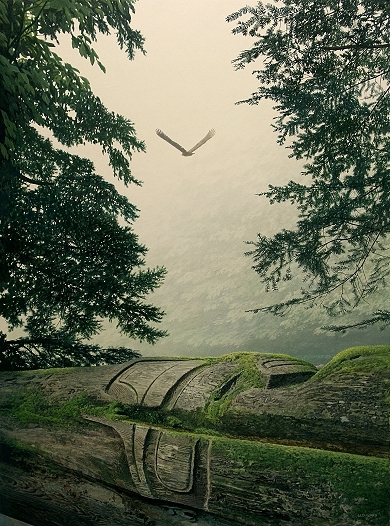 "The Watcher And The Wanderer"
To view a selection of older works, see the "Portfolios" section of this site. The vast majority of these paintings are sold but you may enjoy the stories. 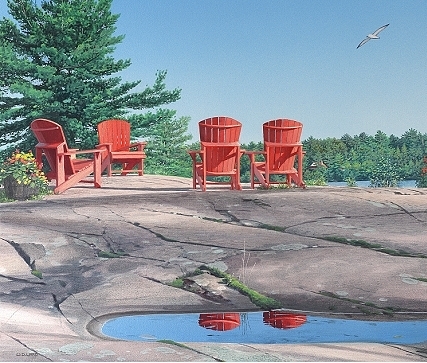 A number of available works can be seen at the Loch Gallery locations in Toronto and Calgary.